Salford Quays has become an excellent place to take architectural photography. 20 years ago these docks were a wasteland, now they have been radically transformed into an architects playground. 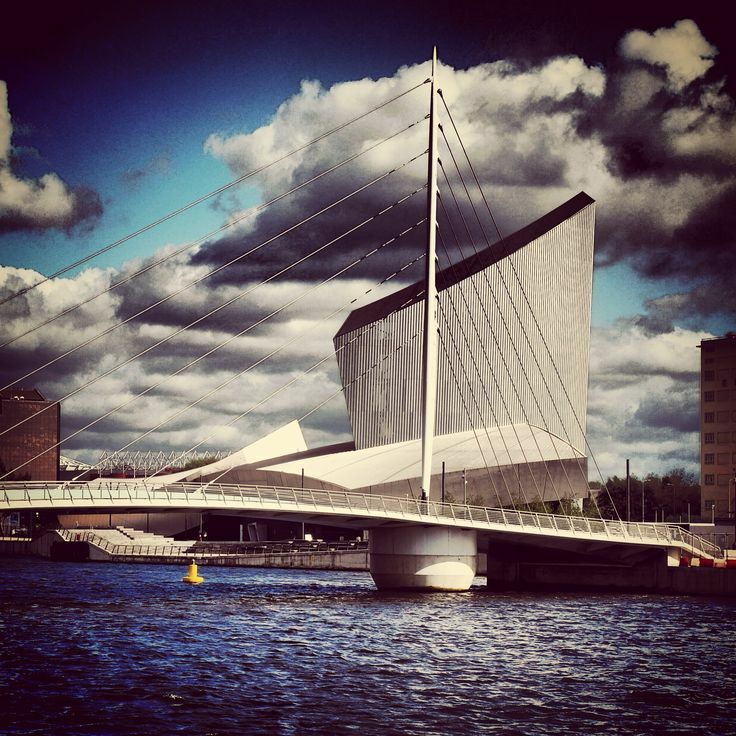 The Imperial War Museum North is an amazing building inside and out. I love how it stands on the edge of the Quays looking like a ship resting in dock. Inside they have some of the most effective exhibitions about war - I never leave the place with a dry eye. As part of the Media City redevelopment a new footbridge was built, imaginatively called the Media City Footbridge. I love the sleek design and believe it or not, but it's also a swing bridge. So beautiful and yet so practical. The bridge designers had an inspired moment designing this bridge. I swear they were standing where I took this picture and thought an asymmetric, cable bridge would be wonderfully offset by the museum. To me these two structures transform into modern day clipper ship in this picture. I got lucky with the weather this day as the clouds add drama to the photo. It was also a windy day and so the Quays were quite choppy, which adds texture to the water. This picture was processed via Instagram. I double filtered it - I'm not sure which ones, but probably X-Pro II and Lo-fi. Salford Quays is one of the best places to visit in Salford with plenty of photo opportunities. So take your camera, but remember take a jacket as it always seems to be windy.